Hey maybe this bridge hunting stuff is catching on. I see that Glen Reynolds over at Instapundit has a picture up today of the ongoing construction of the new Chapman Highway bridge across the Tennessee River in Knoxsville. His picture calls it “Calhoun’s Bridge”. 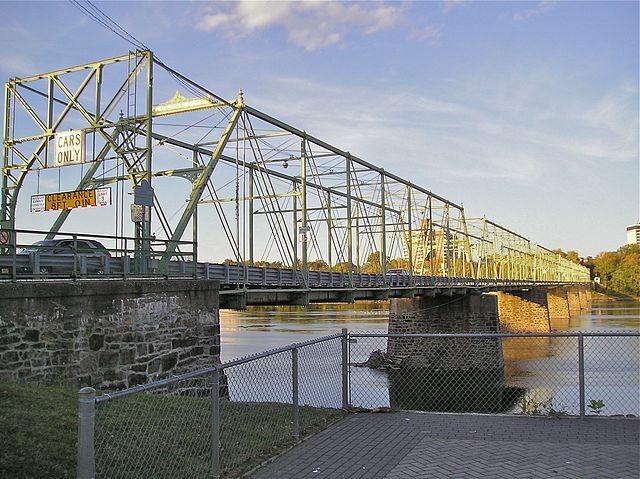 Here’s a picture of an actual Calhoun’s, the Calhoun Street Bridge in Trenton NJ. Built in 1884 by our favorite swords into plowshares builders The Phoenix Bridge Company, this 7 section simple span Pratt through truss is made of wrought iron and is nearly 1275 feet long. Almost 129 years old, the free bridge has been recently refurbished and sees 18,500 cars cross it daily over the Delaware River. No one is making the claim, but it is likely the longest Phoenix column bridge left in the world. The bridge is actually older than cars, coming to life nearly a decade before any motorized vehicles existed in the USA. Times change; these days a sign on the bridge says HORSES NOT PERMITTED ON BRIDGE. I’m off for a short trip down-county, to check on a bridge or two myself.